Have you ever felt that you were throwing away money every week for caddies? That’s how I began to feel after golfing for a few years. I figured its 2019, there has got to be a better alternative. One day I was playing a round with some friends and the fellows playing through were using some kind of automated robo-caddy. It was this machine that was just following them as they walked to the next hole. I was stunned. I had to ask them about it and they told me that it was their electric caddy. That was exactly what I was thinking of when I was contemplating how much money I was spending for caddies. I immediately did some research online and that is how I came to use the Stewart Golf X9 Follow Electric Cart. So I’d like to give a bit of insight into my experience with this unit so far. 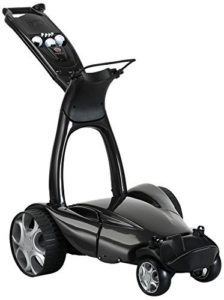 Essentially, the Stewart Golf X9 takes the place of a normal caddy so if anyone is interested in having a bit more privacy and saving some money on the links, this model may be just the thing for you. Now the problem I was having was that it was getting hard for me to justify spending money on caddies every week and I am surely in no physical condition to carry my own bags. The Stewart Golf X9 was the solution for both of those concerns. It does require a bit of an initial investment as the average price for this particular model is about $2,400 but it pays for itself in short order if you golf regularly. Plus it offers loads of helpful features like hands-free mode. You can set it to follow you automatically as you walk the course. It is pretty convenient as well. The hands-free modes utilize a Bluetooth connection that you don’t have to fumble around with. It connects quickly with the touch of a button. Once you have it in follow mode it is very intuitive. It follows closely enough so that it doesn’t lag behind but not too close to where it is going to crowd or run into you. I would say that it follows at about a comfortable 3 foot distance. It adjusts speed as you walk as well. It speeds up if it senses your pace has increased and it slows down when you slow down too. And of course when you stop, it stops. When you take it out of the box, it will require a charge which takes about 4 hours. I personally like the fact that I can easily detach the battery and charge it inside the house or in the garage so a lot of times, I just leave the cart itself in the boot of my car while I charge the battery elsewhere. I use the manual mode fairly often for when I want to send the cart up the fairway or so that it gets to the next hole before I do. It is useful for when pathways get a bit narrow too. Of course, you can always opt to push the cart with your own two hands as well. The handset/remote control is easy to get used to. Manual control mode is very precise. The follow mode is highly intuitive. Has an emergency brake feature. The unit is a bit heavier (31.08 lbs) when compared to other similar electric carts. It may tip over a bit if a heavy bag is placed on it and is run at a high speed. It is a bit pricey when compared to comparable carts. Can be a bit cumbersome to carry when it is folded down. The Stewart X9 Follow Electric Cart looks great and overall, it is a great alternative to paying for a caddy. While the sticker price is a bit lofty it is well worth it if you play often. The automated features also make it a great investment by allowing the player to do what they really want between holes like have a drink or send a text. This is a must have for modern golfing and in particular, the Stewart Golf X9 cart has a really great design. I encourage anyone looking for more convenience and a great golf investment to try out the Stewart Golf X9 Follow.